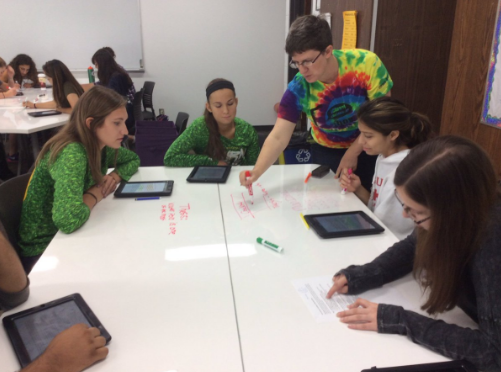 One of our goals in the Collab Lab is sharing our practices by getting into classrooms and seeing student learning in action. Here are some highlights! In Kim Miklusak's class, students were put into groups based on general teacher feedback on an area for improvement: organization, evidence & depth, or counter claims & analysis. 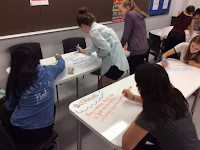 Each group sat with a table leader, a student who was successful on this first essay, and the table leader guided the group in self-analysis of their essay. 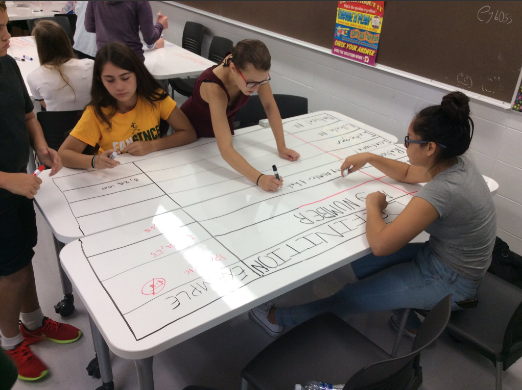 Students used the white board tables to chart evidence and counter claims or to organize and re-organize their main ideas. 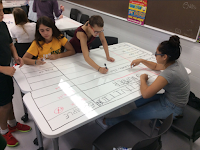 While this could have been done on paper, the act of writing, rewriting, and seeing each other's work in progress helped students collaborate on similar skill areas with the guidance of a peer. 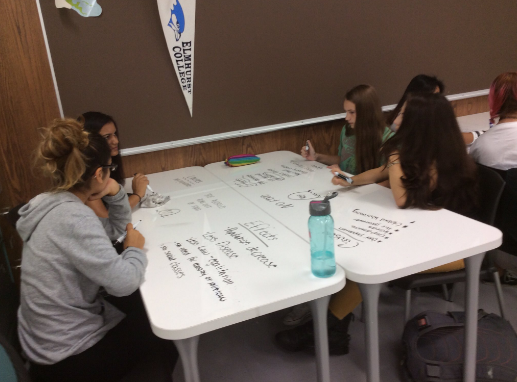 In Dave Johnson's PreCalculus class, students are learning how to manipulate literal equations. To reinforce their learning, he had students record videos using the app called ShowMe. Students were able to work in pairs or alone to talk through the process of solving a literal equation. 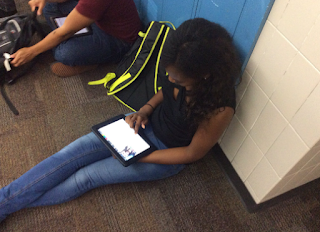 Click here to listen to this student's video. 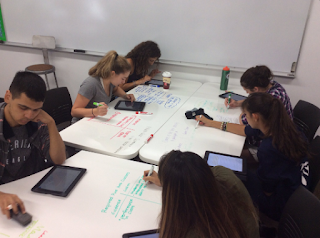 Students read five key documents and for each document wrote the causes and the effects of the event described. Students wrote the causes and effects on the white board table. 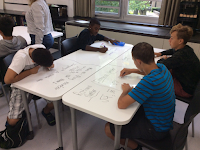 The students were able to walk from table to table to provide feedback to one another. 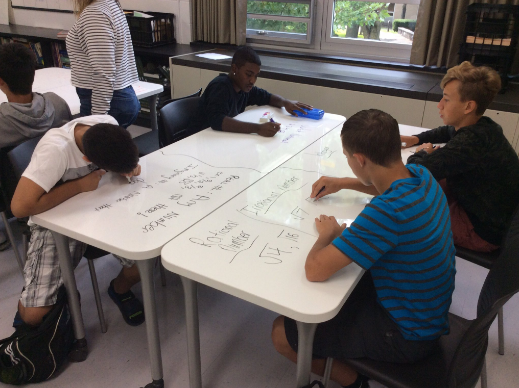 In Ami Heng's Honors Advanced Algebra class, students reviewed for their test by making study guides on the whiteboard tables in the room. 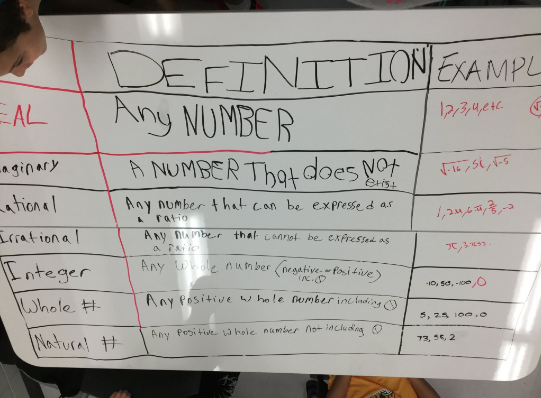 Students worked in groups to come up with definitions and properties, as well as provide examples of the different types of numbers. 5. 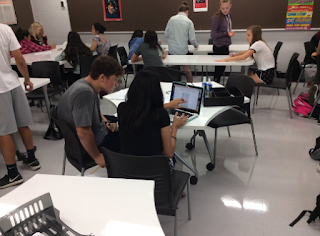 ...while having 1-on-1 conferences! When students were working in their groups to build study guides (#4), Ami Heng had individual conferences with students. This allowed her to go over their beginning of the year benchmark test scores and discuss their progress in class so far this year.